Franchise Business Review, a national franchise market research firm, announced the companies that made its 2015 Top 200 Franchises list, the only national ranking of franchise opportunities based solely on franchisee satisfaction and performance data. Receiving the Franchise Business Review Top 50 Award speaks to our company’s motto and is a true testament to the exemplary service we provide to our franchise owners. 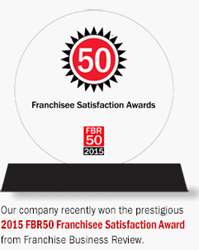 FPC is proud to have been ranked amongst the TOP 50 FRANCHISES and winner of Franchise Business Review’s Top 50 Franchisee Satisfaction Award. To identify the top franchises, which include a variety of concepts and industries, Franchise Business Review surveyed more than 28,500 franchisees, representing over 350 franchise brands. “One of the best ways to know if a franchise is really a good opportunity is to look at franchisee satisfaction data,” said Michelle Rowan, President of Franchise Business Review. “Many of the companies on our Top 200 Franchises list share their Franchisee Satisfaction Reports publicly in order to provide potential franchisees with frank feedback regarding their training and support, financial opportunity, and other key areas that influence the health of a franchise system.” Obtaining the coveted Franchise Business Review’s Top 50 Franchisee Satisfaction Award is a true testament that the key to FPC's vitality has always been the personal relationships built with the individual owners of FPC offices. FPC is a strong, close-knit network of professionals who specialize in niche industry categories to help fill their clients’ critical staffing needs. FPC is a closely held, private company which affords its franchisees a direct line to the CEO for any questions or concerns. At FPC, franchisees are truly part of a “family” that share best practices, business opportunities and celebrate success together. The company’s motto is “Be large enough to support a national system, but small enough to remain personal, flexible and responsive to our owners’ individual needs. Receiving the Franchise Business Review Top 50 Award speaks to our company’s motto and is a true testament to the exemplary service we provide to our franchise owners.” One other competitive advantage of being part of the FPC system is the “Exchange Program.” This program allows offices to share candidates and jobs which helps them to increase revenue within their own discipline and make additional placements in areas they don’t cover themselves. Today the company is led by CEO, Ron Herzog. Ron has continued the company’s commitment to the achievement of its owners. The company takes a long term view of the business by adding a steady stream of new, high quality offices while focusing on supporting an existing network of successful franchisees. Most recently, FPC announced the launch and opening of their international venture - FPC of Toronto in Ontario, Canada. In addition, Herzog has kept FPC in the forefront of the industry by adopting and implementing up-to-date technology. This enables the company to make use of advanced online recruitment marketing techniques that benefit the entire FPC network. If you feel you are ready to take control of your personal and professional life, enjoy increased income potential and the equity that comes from owning your own business, we would like to talk to you and determine if FPC is your next step. For anyone considering buying a franchise, FPC is a great place to start. Click here for more information. FPC is a leading national executive search firm comprised of more than 60 franchise offices. FPC offers job seekers access to its nationwide network of professional executive recruiters and job opportunities in many industries and disciplines as well as providing job search information and assistance. The company has been providing win-win recruiting solutions since 1959. Advocates for both clients and candidates, FPC recruiters are committed to bringing together the right individual with the right opportunity. For further information about FPC, call 800-886-7839 or visit us at http://www.fpcfranchise.com.